In 1869, when this Punch cartoon was published, the Dean and Canons of Windsor were embroiled in a lengthy dispute with the Board of Works about repairs and alterations to the west Castle wall during the restoration of the Horseshoe Cloister. The disagreement arose from the need to obtain permission from the Crown, which maintained ownership of the whole of the Castle wall, to increase the number and size of the windows built into it, and, more significantly, concerned the question of liability for the costs of repairing the stonework. Documents in the St George’s Chapel reveal the length and intensity of this dispute. However, the inclusion of this cartoon in one of the folders [SGC XVII.61.13] suggests that at least one of the parties at Windsor, whether the Dean, one of the Canons or the Chapter Clerk, maintained a sense of humour. In the cartoon, drawn by John Tenniel who is best known for illustrating Lewis Carroll’s Alice’s Adventures in Wonderland and Through the Looking Glass, an official from the Board of Works, the Beadle [‘(B)aedile’], is revealed as a philistine not interested in art [‘hart’], sculpture, gardens nor architecture but only in taking ‘care of the money’. One gets the impression from his Scrooge-like posture, that his interest in money is restricted to refusing to issue it. 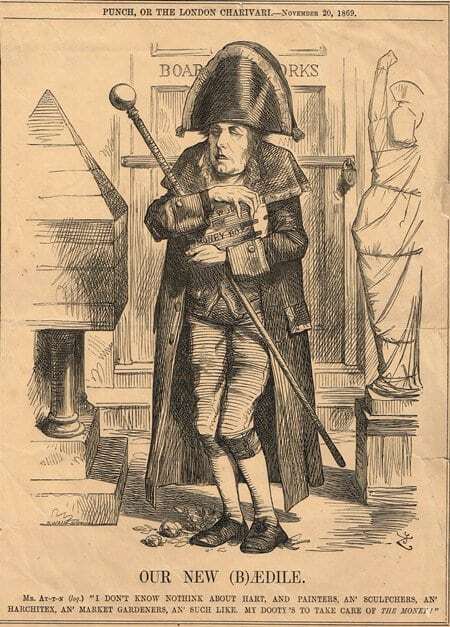 His name ‘Mr Ay-t-n’ [Hating] also indicates the unhelpfulness of his character, whilst on his Beadle’s staff is engraved the word ‘retrenchment’.